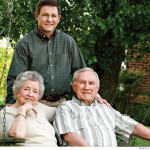 (Money Magazine) — Is Dad mixing up his pills? What happens the next time Mom falls? If you have an elderly parent, chances are you’ve spent more than one sleepless night worrying about such things. Sure, moving him or her to an assisted-living facility or a nursing home might help. But the average annual cost is $38,000 and $67,500, respectively, and that doesn’t include the hefty emotional price: Surveys show that seniors fear nursing homes more than they do death itself.